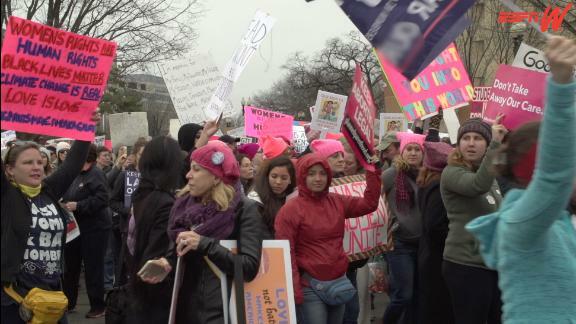 Sights and sounds from women's marches throughout the U.S.
Victoria Barron of espnW talks to people attending the Women's March on Washington to find out how they plan to move forward. 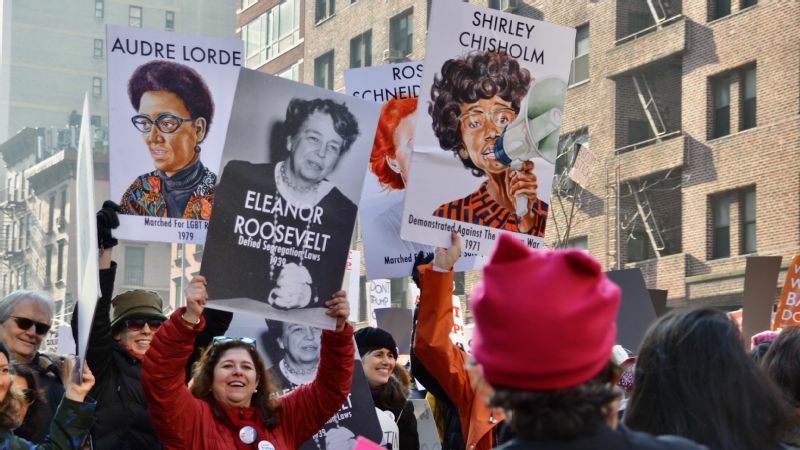 Hundreds of thousands of people participated in women's marches in more than 650 cities and towns worldwide on Saturday, in solidarity with the Women's March on Washington, which organizers say drew a crowd of more than a quarter million. Members of espnW's staff were stationed at women's marches throughout the U.S. Here's what they saw and heard. Kate Fagan: "I debated attending the New York march because I didn't want to see our country any more divided than it already seemed. But in the end, that emotion took a backseat to wanting and needing to be near other people who have been struggling in the same way the past two months. 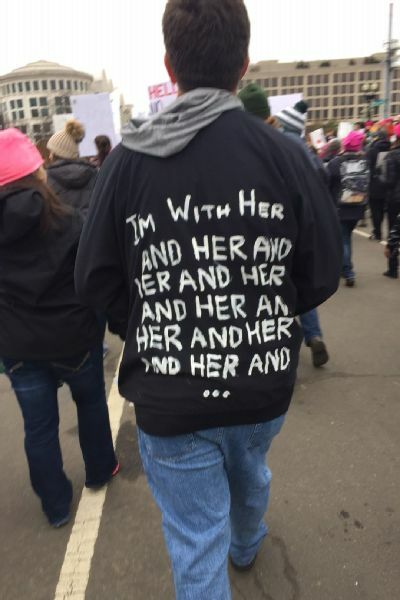 I'm so glad I marched. I was reminded of how important all our voices are. My favorite moment was when we overheard three older women talking to each other, and one said to the others, 'It's good to see activism is back! Guess we need to get back at it like we used to!' I walked away inspired, touched and ready to keep fighting." Sara Johnson: "Well done, New York City! I don't know what I expected at the march, but I can tell you what I didn't: the smiles. Every. Single. Person. Literally every single person, of the thousands I passed, young and old, of every gender identity and sexual orientation, of every generation, race, religion ... from baby backpacks and kids on shoulders to wheelchairs and walkers, everyone was smiling. "All inspired. All cheering. All acknowledging one another for their presence and differences under the umbrella of human rights. I saw no fear. Or defeat. Or judging. I only saw fierce determination, hope and grit, brilliant signs and a massive celebration of unity in diversity. And, my face literally still hurts from smiling back." 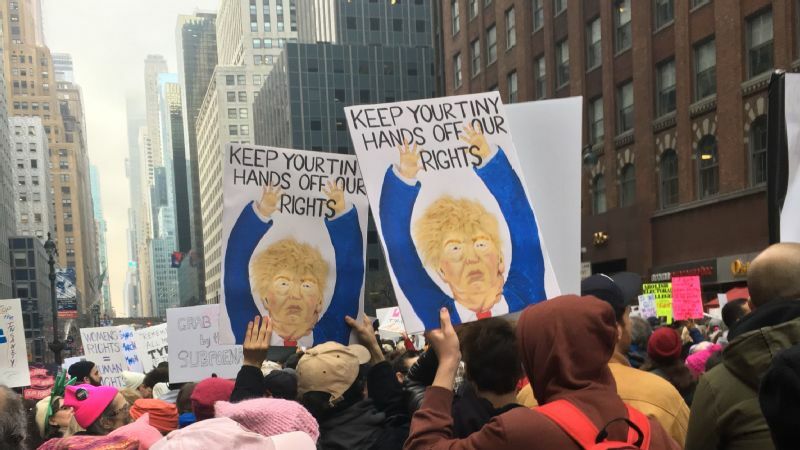 Jenn Holmes: "In a day of peaceful yet boisterous protest in New York, about halfway through the five hours we marched, I realized I had been smiling more in those few hours than in the past few months. My heart and spirit were lifted. So many families and men and, of course, nasty women marching together to support rights for everyone. In a bar after the march, we chatted with another couple who was also reflecting on the day, and the woman said how she wished there was a march every weekend: 'We need this. We have to keep the momentum going. We can't back down.' And then we did the most sports thing ever: We all high-fived." 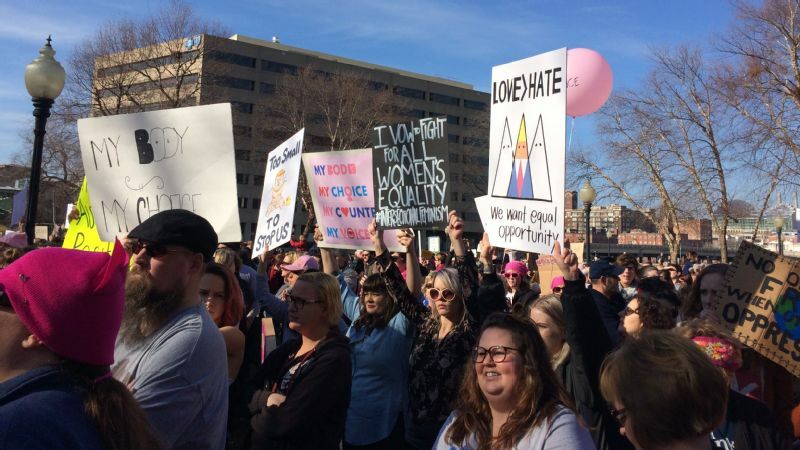 Alyssa Roenigk: "As I was leaving City Hall, I read online that 750,000 people attended the Women's March in L.A. As incredible and surprising as that number is, it sounded low. The energy and spirit that filled downtown L.A. this morning felt like they were generated by seven million. "What struck me first was how many men and families and kids were marching alongside their mothers and sisters and friends and -- because we were in L.A. -- Miley Cyrus and Bette Midler." Sarah Spain: "When my husband and I met up with friends early Saturday morning to head to the Women's March, an estimated 40,000 people were set to walk together in solidarity through the streets of Chicago. 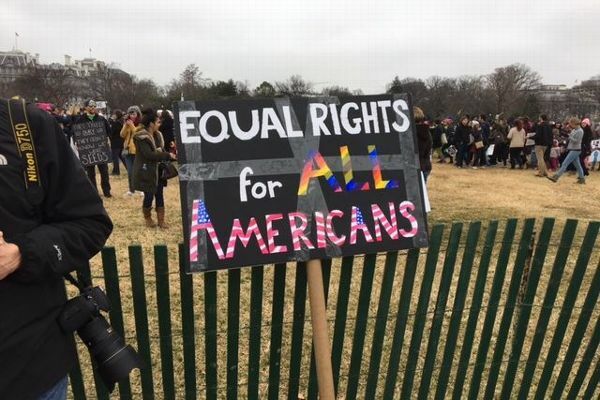 Two hours later, as crowd movement stagnated in Grant Park, we found out via social media that the march part of the rally was cancelled because the planned route couldn't accommodate the estimated 250,000 in attendance. "We were proud of our huge numbers but understandably disappointed. We decided to make our voices heard via chant, song, sign and presence, even if while standing in place instead of actually marching. To our surprise, about a half-hour later, the crowd started to move, and the march was on. "The crowd was peaceful, passionate and supportive. There were men, women and children (and dogs!) of all ages and races. There were signs supporting myriad causes -- some funny, some straightforward, some beautiful, some angry. "My favorites read: 'Quality men don't fear equality,' 'A woman's place is in the house or senate,' 'The rise of women is not the fall of man,' 'Girls just wanna have FUNdamental rights' and 'Make empathy great again.'" 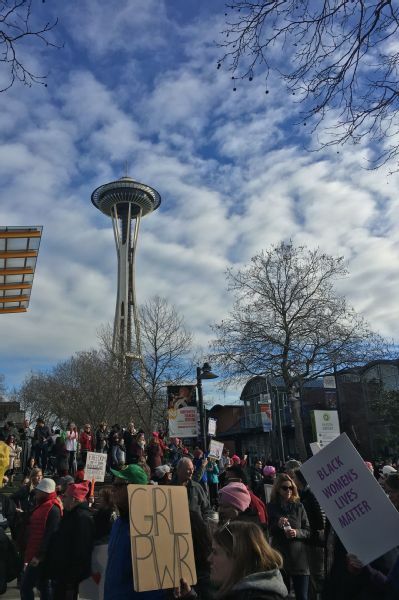 Melanie Jackson: "My family and I were among an estimated 130,000 who marched in Seattle. It was loud, powerful, pink and uplifting. Indigenous people with drums kept a rhythm for our feet. Children squealed from Baby Bjorns, parents' shoulders and wagons. Rainbow flags whipped in the wind. "But it's the intimate moments I'll cherish most. The lingering eye contact with total strangers of a dozen different races, an unspoken bond that we were united. The knowing nods among other moms there with their kids. The appreciative smiles toward men whose own powerful signs made their case for my body's rights. "I was inspired by men and women walking with canes, old enough to have done the same on younger legs in the 1960s. I marched alongside a trio of young girls still in their soccer uniforms, who rushed to join in the march after their game. I felt love. I felt safe. And for the first time since the election, I felt hopeful." Katie Barnes: "I had been initially concerned about attending the women's march because I wasn't sure if it was a going to be a space for me, as a gender-fluid person of color. Then I stood in community with people who reflected how I identify and move through the world -- my mirrors, all joining the march from the National Conference on LGBTQ Equality: Creating Change. We are here, we are certainly queer, and we showed up today in a beautiful demonstration of collective power." Jane McManus: "My dad lives on Capitol Hill, and in the past few weeks, he's been sending me updates about the march. He has a bad knee, a bad hip, but it was really important to him to go. 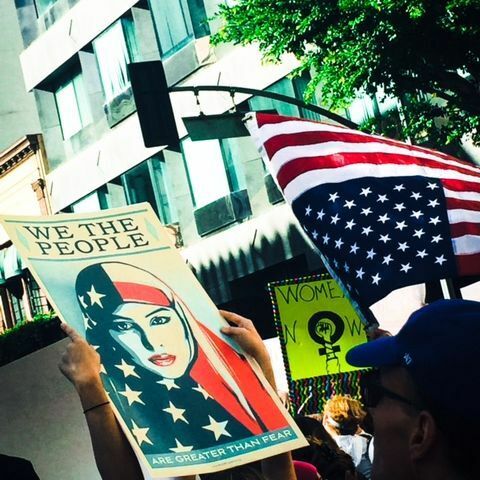 He even made his own sign, taking a copy of the iconic shot of a Muslim woman in a hijab that resembles a flag. 'We the people,' it said. "Dad and I got there a little late, 2 p.m., but the crowd was still huge. We walked next to a woman in a walker, behind another woman in a wheelchair. Can you imagine how important it was to all of them, despite mobility issues, to join their strength with this crowd of men and women? "I saw signs that made me laugh and ones that made me angry. But here's the thing: This diverse crowd of people looked at each other and said, 'I got you.' We chanted in support of trans people and black lives and in support of equality. We passed the Newseum and chanted for freedom of the press. "This could be a long four years, and our rights are being threatened. But we have each other. Let's look out for each other." 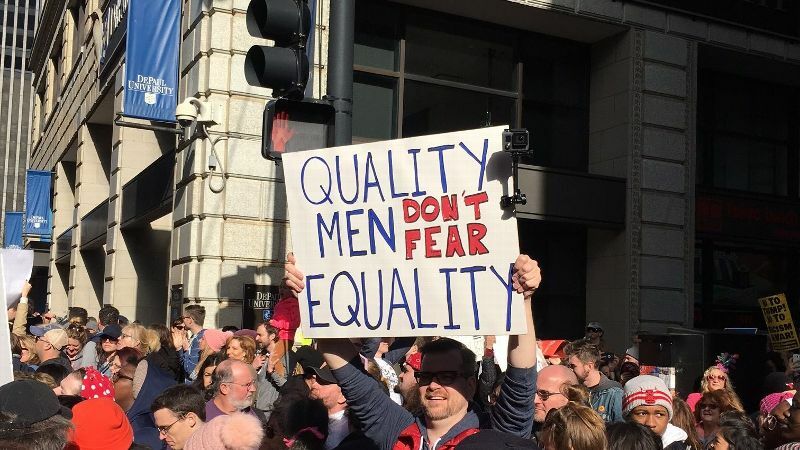 Carol Stiff: "What a powerful day in D.C. for the March. As I departed the event, this was the last sign I saw with the White House in the background. It was exactly what is so important in our lives and the lives of (all) our D.C. children." Mechelle Voepel: "We're often called 'flyover' country here in the Midwest. And indeed today we had helicopters flying over Washington Square Park in downtown Kansas City to get photos of the large crowd present. People gathered here peacefully, purposefully, and in good spirits to demonstrate their support for diversity, kindness, women's rights, LGBTQ rights, affordable healthcare, welcoming immigrants, Black Lives Matter, and working together, among other issues. "I was proud of the turnout and the optimism. I told one energetic, photo-taking little girl, 'The world will be yours, and as you grow, you'll be ready to do anything.'" Michelle Smith: "Oakland and San Francisco were very different experiences. Oakland was sunny and dry -- after days of soaking rain in the Bay Area -- and crowded from the moment we stepped off the BART train, the stairwells packed just to get up to the street, people cheering spontaneously. It literally rolled through the crowd like a wave. The slow walk in Oakland -- it took us an hour to get three blocks -- was a family affair, filled with strollers and small children on their parents' shoulders, and music at every corner. "San Francisco was grittier. Initially, there was room to move around and breathe, and then all of a sudden, an explosion of people. 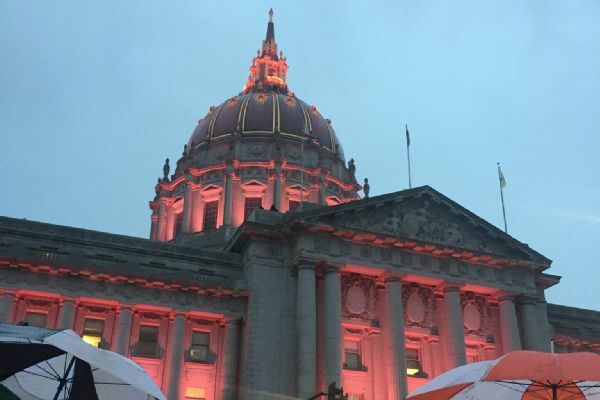 The weather turned by early evening and when Joan Baez began to sing from the stage facing City Hall, the sky opened up and it poured. 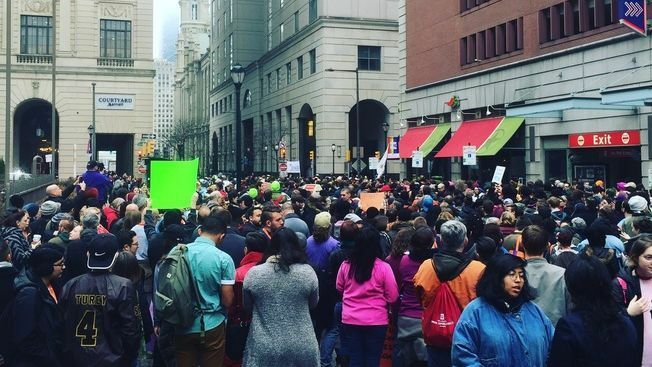 "The lights on City Hall turned pink and the crowd began a slow, soggy crawl down Market Street, bodies jammed and jostling as people chanted and jumped around puddles. It wasn't until the march opened up on Market Street heading toward the Bay, the rain still steady, that people seemed to relax a bit. "Suddenly music pumped from some of the surrounding buildings and offices and it felt like a party. A party full of people with a point to make. Which is San Francisco in a nutshell."